The countdown is on with another polymer clay christmas ornament tutorial! Are you ready for Christmas? If not, this week we’re taking 5 days to give you 5 FREE Christmas Ornament tutorials. If you missed ANY days of this ornament series so far CLICK HERE to see them all. The 5 Days of Ornaments series continues with this super simple polymer clay tutorial for a Santa Claus ornament. Remember, every one of these project was designed to be made in 10 minutes to less. Enjoy! 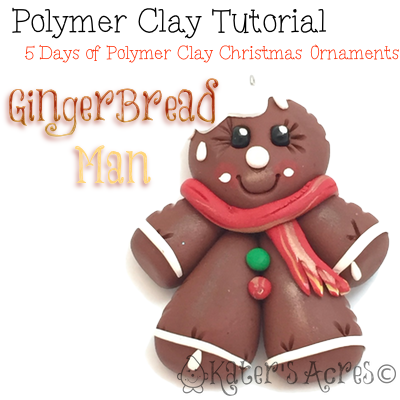 This polymer clay christmas ornament tutorial for this adorable GingerBread Man can be whipped up in less than 10 minutes. Make one or several. Use them as small gifts, stocking stuffer, or even to tie onto packages for cute doses of whimsical Christmas fun. ENJOY! Fully condition your clays for this project. Get additional help on conditioning here. Divine your clay into 5 portions, 2 being bigger than the other 3. Make the largest two pieces the legs by rolling into teardrops. These will be your legs. Use two of the other portions and roll into teardrops of similar size. These will be your arms. Roll the last piece into a ball and flatten in the middle and on top of the joins of the teardrop. Use scrap clay and fashion a scarf around his neck. Add the two e-beads for the eyes using a needle tool. Draw a mouth as well using a needle tool. Choose a color of scrap clay to fashion a nose for your Gingerbread Man. Use your white clay and roll tiny thin snakes of white to use a icing trim for your arms, feet, & head if you choose. Add some buttons using scrap clay. Add mica powders or blending chalks as preferred. Insert an eye pin toward the top (see tips at right). Press the eye pin down firmly into the clay. Bake in a 275 degree oven for 45 minutes (if using Premo! polymer clay). Once the ornament has cooled (about an hour after baking), remove it from the oven. Varnish the ornament if you choose.